So despite not having completed Inktober, when the month rolled over to November I decided to take on a second consecutive monthly art challenge. One of the things I struggle with when drawing my monsters is what shape to start with. So to make it easy, every image for Huevember would begin with a circle. Initially I wanted to use my alcohol markers, because I love using them. So I had some more swatching fun. Some days ended up close enough, like Day 1. Some days were spot on, like Day 3. And some days weren’t very close but they’d have to do, like Day 4. But eventually I had my palette. …and I chose to ignore it. Because I love my alcohol markers and I was commited to that particular square sketchbook. But then I started colouring. This is the point where I wised up and decided to use a different medium. So I got out my beautiful Faber Castell Polychromo pencils and got with the swatching again. Until I had another pretty palette. When I can’t decide what to draw, I grab my dice and provide myself with some pieces that I HAVE to include. 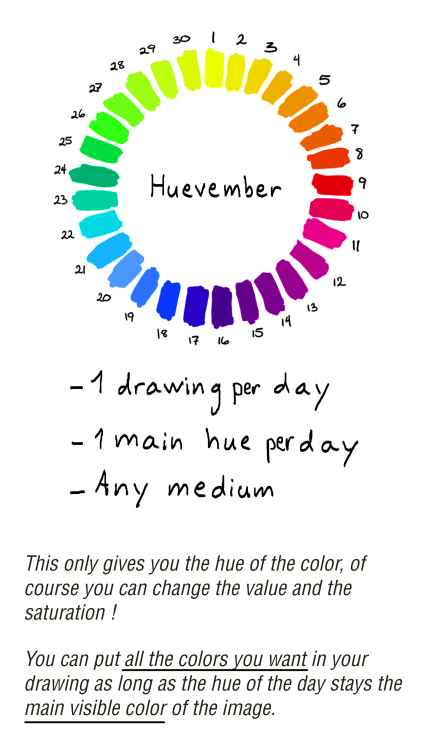 Wouldn’t it be fun if all my Huevember pieces used this chart? The problem I’ve found is that I roll a lot of high numbers for number of things to include. So some of my monsters have come out looking a little odd. But that’s okay. All my drawings are a little odd. I’M a little odd. …and 11 blank pieces of paper. I am not partaking of a monthly art challenge in December – unless you count this Arty Advent blogging thing I’m doing – but I do plan on finishing Huevember by the end of the month. And then in January there’s Art Jounral January, or Creatury…. PS: I can’t leave a monster unfinished so I finished that monster from the false start.